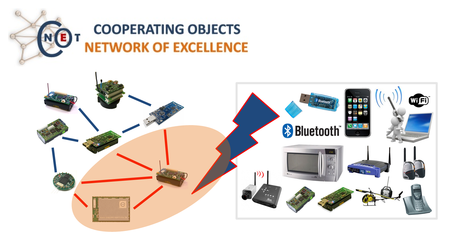 CONET, the Cooperating Objects Network of Excellence, is an EU-funded project that aims at fostering a European research community in the emerging domain of cooperating objects, i.e., wireless networks of embedded systems that perform a task in cooperation. CONET funds several research clusters, our group is active in the Resource Management and Adaptation cluster which addresses robust and reliable low-power wireless communication among static or mobile objects. In fact, communications in wireless sensor networks is challenged by external interference from transmitters operating in the same frequency range such as Wi-Fi and Bluetooth and by electromagnetic radiation produced by appliances such as microwave ovens. Within CONET, we study the impact of RF interference on sensornet protocols, and we design novel solutions that mitigate interference and increase the robustness of wireless sensor networks communications. We further investigate new link quality estimation techniques for low-power radios. Finally, we are developing testbed and simulation tools to enable experimental study of protocols under interference.